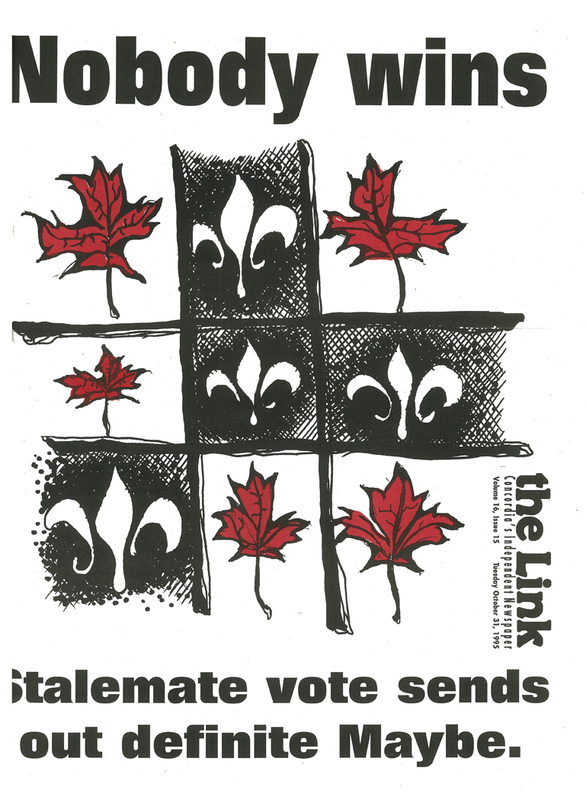 The Oct. 31, 1995 edition of The Link focused on an issue that this provincial election is definitely maybe not about. “Nobody wins: stalemate vote sends out definite Maybe,” said the cover copy of The Link’s issue the morning after the crucial referendum vote. Link reporters witnessed the vote—decided by a razor-thin margin of just over 1 per cent—at the No and Yes camp headquarters. On the eve of Halloween, Christmas came early for the No forces, as they won last night’s referendum by a vote of 50.6 per cent to 49.4 per cent. With such a narrow victory, leaders of the No side called for Quebecers to respect the decision and to work together toward achieving their hopes and dreams. Pierre Patenaude, a community organizer for the CLSC, agreed with Johnson’s message. Before the results started coming in, No supporters at Metropolis were not ready to predict the outcome. The last opinion polls, released over the weekend, had the No side trailing the sovereignists by a slim margin. A youthful crowd cheered ecstatically as the early returns from the individual polling stations came in showing the federalists ahead. They booed when the results showed the Yes side still leading. At 9:30 p.m., the No side surpassed the magic 50 per cent mark and the crowd went wild, chanting “Canada! Canada!” and “No! No!” while waving Canadian and Quebec flags. For Julie Forget, a 23-year-old engineer, it was the moment she had been waiting for all night. Even before the sovereignist side conceded defeat, the media declared a No victory around 10:30 p.m. The interpretation of the close vote is still unclear and reactions were varied. 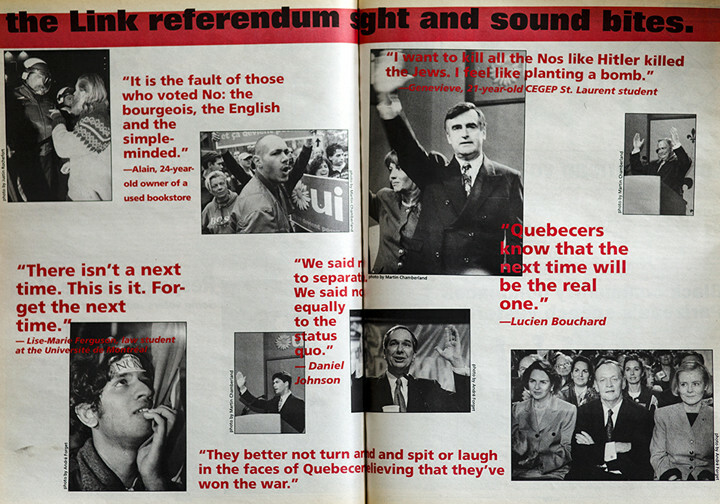 Echoing the words of Réné Levesque, Bloc Québécois leader Lucien Bouchard appeared on Metropolis’ large video screen, promising to continue the fight for sovereignty. But for Lise-Marie Ferguson, 24, a law student at the Université de Montréal, the outcome was a clear message to separatists. Patenaude agreed, adding the federal government could not ignore Quebecers’ desire for constitutional change. In their victory speeches both federal Progressive Conservative leader Jean Charest and Quebec Liberal leader Daniel Johnson recognized the need for change. Charest emphasized the contribution made by the rest of Canada in the final days leading to the referendum. Although people at the No headquarters were relieved by the vote, the debate over Quebec’s future in Canada remains unresolved. An emotional and bitter Premier Jacques Parizeau blamed ethnic voters for the Yes side’s narrow defeat in last night’s sovereignty referendum. Parizeau appealed to new and old supporters to continue working towards their goal and not be discouraged. The evening began with jubilant cheers as the initial results from the eastern regions of the province suggested a solid Yes victory, but it ended in tears for the sovereignists. The No side came from behind to win the referendum by the narrowest of margins, 50.6 to 49.4 per cent at press time. As the tide of returns swept from east to west across the province, the crowd waved flags and chanted, “We want a country.” When traditionally pro-sovereignist east-end Montreal began to post No majorities, the hall fell silent. The momentum began to ebb as nervous and restless spectators watched their early lead erode. With 65 per cent of the vote returned, the margin between Yes and No was so slim it was being calculated in hundredths of percentage points. 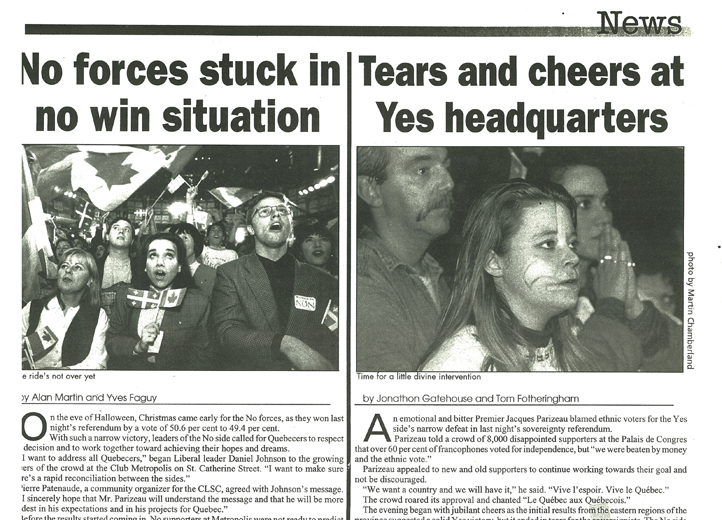 Radio Canada waited until 97 per cent of the vote was counted before announcing a No victory at 10:20 p.m.
People in the hall broke down in tears, hugged their friends and waited dejectedly for three sovereignty leaders’ responses. “Never before has a Yes victory been so close as it was today. It hurts,” said Bloc Québécois leader Lucien Bouchard. In a voice choked with emotion, he told supporters not to give up the fight for a sovereign Quebec. Action Démocratic leader, Mario Dumont, stressed that a record number of Quebecers voted for radical political reform. Separatists sang several choruses of the nationalist anthem, “Gens du Pays,” in tribute to their leaders. Although faced with the grim reality of a second referendum defeat in 15 years, there was as sense of determination in the crowd rather than resignation. On the night when sovereignists believed that Quebec would take its place on the world stage, supporters in the crowd refused to see the defeat as the end of the dream of an independent Quebec. « Denied the Right to Vote… Again?